I have to hand it to author Jenna McCarthy, the scribe behind If It Was Easy, They’d Cal the Whole Damn Thing a Honeymoon. She’s not only hilarious (check out the funny trailer for her book), but she’s also brave and wise. The hilarious Jenna McCarthy mentioning my book in her TED talk! How do I know this? Because she recently gave a speech about “How to Live Happily Ever After” for a TED conference in front of a packed house (brave) that was full of smart and surprising advice on how to be happily married. And even wiser? In talking about how to find the right partner to marry, she featured my book cover for Meeting Your Half-Orange in her speech! (Pay attention at the 9:20 mark). I’ve picked up a few tips from Jenna’s speech, which is why I’m going to buy my husband some really fattening cookies today. 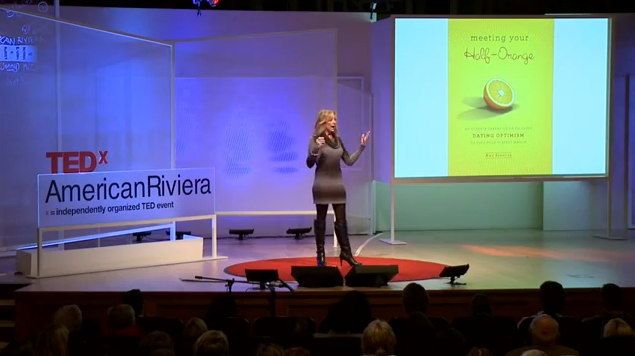 Watch her talk and you’ll learn why that’s just one of a few fabulous ideas for living happily ever after. Here’s the video—find a free 11 minutes (oh, let’s be honest, now is just perfect) and enjoy!